Satna, February 5, 2017: Bangalore-headquartered Peps Industries, India’s leading spring mattress manufacturing company marked the launch of its 140th exclusive showroom-- Great Sleep Store (GSS) at Satna. Smt. 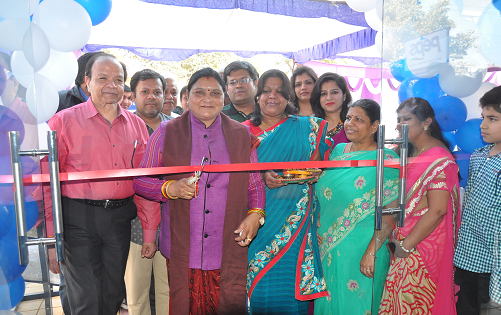 Mamta Pandey, the honourable Mayor of Satna, was the chief guest at the launch that defined the introduction of affordable luxury mattress to the people of the city. Peps caters to every section of the society with a vast range of its product line that includes Spring Koil, Restonic, Spine Guard, Grand Palais Crystal, Double Decker and Vivah mattress. Each outlet is designed with their wide range of premium products such as mattresses, pillows, comforters and much more, to give customers a complete bedroom-like experience. Peps’ Great Sleep Stores embody the perfect picture of comfort while giving customers a clear preview of how Peps can enhance their bedrooms. The stores also exemplify the personality of the brand by highlighting the importance of comfortable sleeping. Peps Industries was established in 2006, by Mr. K. Madhavan, MD, Peps Industries and his two partners. Peps holds the majority stake in India’s spring mattress market and has played a crucial role in bringing world-class affordable spring mattresses to Indian consumers. Peps has partnered with Restonic Corporation of USA, which is one of the largest mattress companies in the world. Being the only Indian company with a licensing agreement with Restonic, Peps has exclusive access to the unique technology of Restonic and can leverage this to expose Indians to international sleep standards. Since its inception in 2006, Peps has seen recorded tremendous growth in producing over 2 lakh mattress annually. The company is now looking to tap into all the different segments of bedroom accessories to become the complete bedroom solution for all. Peps Industries Pvt. Ltd., India’s leading spring mattress company, has a pan India representation with their manufacturing units in North and West India as well. The products are delivered with care to exceed the customer expectations. The manufacturing facility is built in an 11-acre industrial campus in Coimbatore. It is managed by industry experts with over four decades of manufacturing expertise. The Peps sleep solutions also meet the benchmark defined by Restonic Corporation, USA for its Restonic range of products. The technology is patented and unique. Some of the features of the products includes: Marvelous Middle – the unique construction to support one-third of the body’s weight helps reduce the back strain significantly. Spine guard India’s first Inner spring mattress with Visco Elastic foam positioned as End –of – Backache.